The king of fertility clinic promotional merchandise. Frequently sought yet seldom obtained, it sits on a pedestal in the fertility community. Or maybe it’s just me. I think they’re great. Whoever came up with the idea deserves some sort of pen-based award. One frequently finds one’s self wondering which promotional sperm pen best suits their needs. Uncertainty, worry and despair plague the prospective sperm pen owner. With so few options on the market, it is no wonder that angst reverberates around the sperm pen community. The decision of which sperm pen to procure is one weighted with responsibility. It is the consumer’s duty to be fully abreast of recent advances in sperm pen technology if they are to have any hope of deciding which pen best fulfils their needs. The discerning sperm pen owner seeks clarity in a world of pen-related uncertainty. This study seeks to uncover the truth in a scientific, evidence-based study, in hope of guiding today’s savvy consumer towards an informed sperm-pen-related decision. The two test candidates for this study are from Repromed, and Life Fertility Clinic. 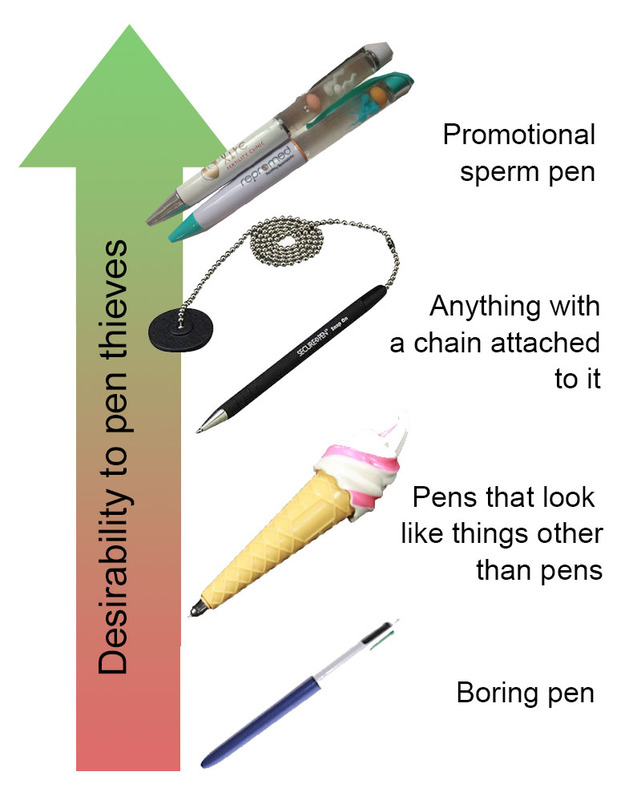 The author notes that the Repromed model of sperm pen was itself retrieved from a locked cupboard from within the confines of the clinic to prevent such an occurrence. One must treat sperm pen related studies with a great deal of sensitivity, as they are the endangered species of the pen world. 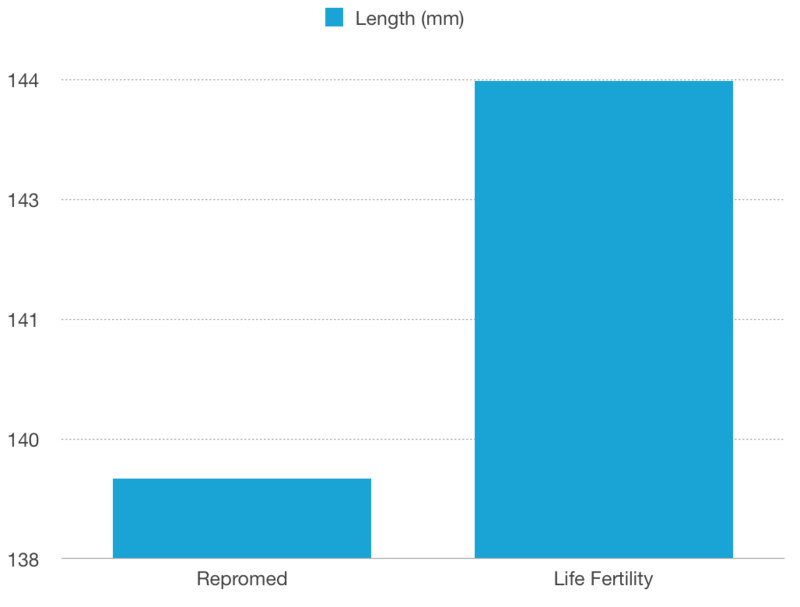 The Life Fertility pen was the clear front runner on length, with an excess of 3mm over the Repromed model. 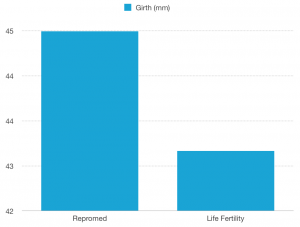 Repromed made a surprise comeback in girth; however one must note this was likely to accommodate the increased sperm count, detailed in the following figure. 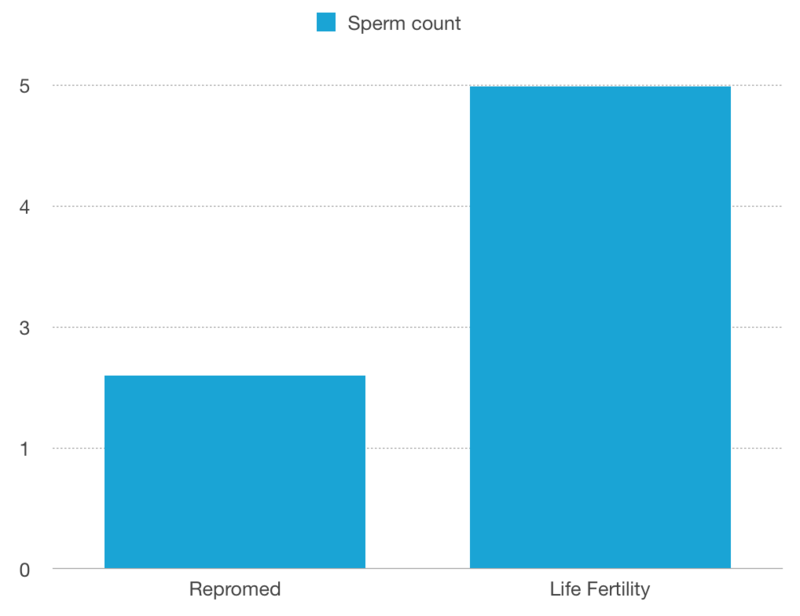 The sperm count of the Repromed model is far superior to Life Fertility’s; however it is difficult to ascertain whether or not this results in increased fertility rates, as a pen loaded with only 5 sperm isn’t ideal in any situation. The speed of the swimmers varied greatly between the two samples. The Repromed pen took a staggering 9.06 seconds to float from one end of the chamber to the other; while the Life Fertility pen swimmers took a lightning fast 1.53 seconds. 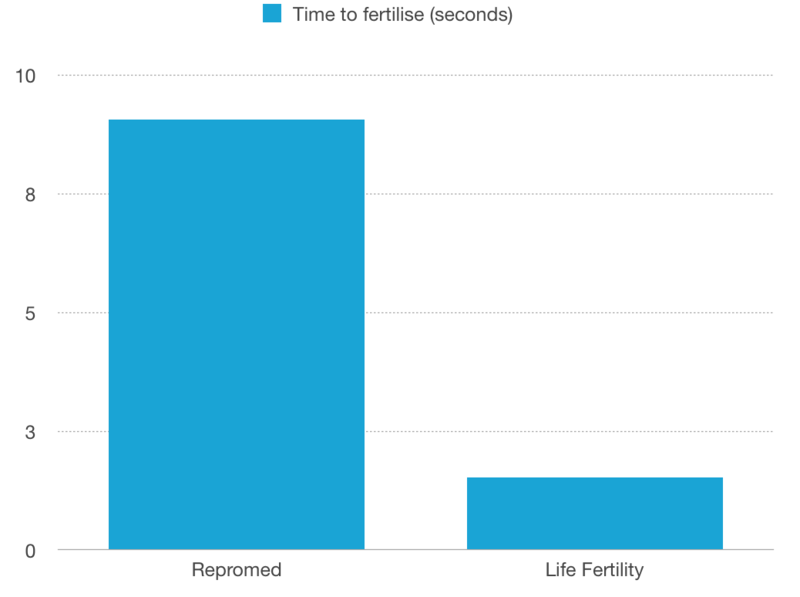 While Life fertility’s pen attempts to fertilise its egg as the user writes, the Repromed model opts for a resting fertilisation, requiring the pen to be upturned to begin the process. This seems counterintuitive; however it is certainly an improvement over Chinese knock-off sperm pens, where they haven’t got it quite right. See for example the following image from a Chinese webshop, where the sperm are running away from the egg (which is fair enough, it has a menacing smiley face and is bright yellow – I’d run too). The shaft of the Repromed pen is deployed with a single click; however the Life Fertility pen requires a more precise screwing action to deploy. If you require silent pen deployment and dexterity is no issue, I’d urge you to consider the Life Fertility model. However, if you’re after speed and comfort, the Repromed pen is the way to go. To conclude, personally I found the flow of ink, alignment to branding and ease of use of the Repromed pen to push it over the line. I wouldn’t hesitate to recommend it to my friends. Do your own research, stay informed and you too will make the decision that’s right for you and your family, leading you to a happiness that only the correct promotional sperm pen can provide. Alas we must disagree.. I can’t really comment on the effectiveness of the repromed pen because they did not feel I was worthy enough to receive one – despite me allowing them to impregnate me with another couples embryo, and then me carrying the bubba to 39 +6 weeks..
Life Fertility, on the other hand, have provided me with several of their pens despite me having never used their services. I have found these pens to be fantastic, and I think the biggest winning quality of these pens is that the sperm chase the egg as you write, you don’t need to hold the pen upside down for this to happen. there are women that need eggs can this be done this way please? I wouldn’t recommend cracking open a pen to get at the egg inside! I am yet to see one of these rare specimens! I wish I’d read your blog before our last clinic appointment – I think my husband’s face during the gifting of a promotional sperm pen would have been the icing on the cake! I was at the doctors office signing the bulk bill statement when I discovered this awesome pen. Resembling a child, I sheepishly asked the lady if they had any more pens like this. I had the biggest smile on my face when she told me that I could have it and not to tell anyone. But I just had to tell someone. I just love these pens soooo much and was able too get my hot little hands on one the other day. Best. Thing. Ever!!!!! Where did you find your pen? Where can I buy one of these pens? I collect ink pens and would LOVE to get one of these. This post was freaking hilarious. LOL. does anyone know whether these pens are for sale as well? When I first saw one of these pens, it was the Repromed one. 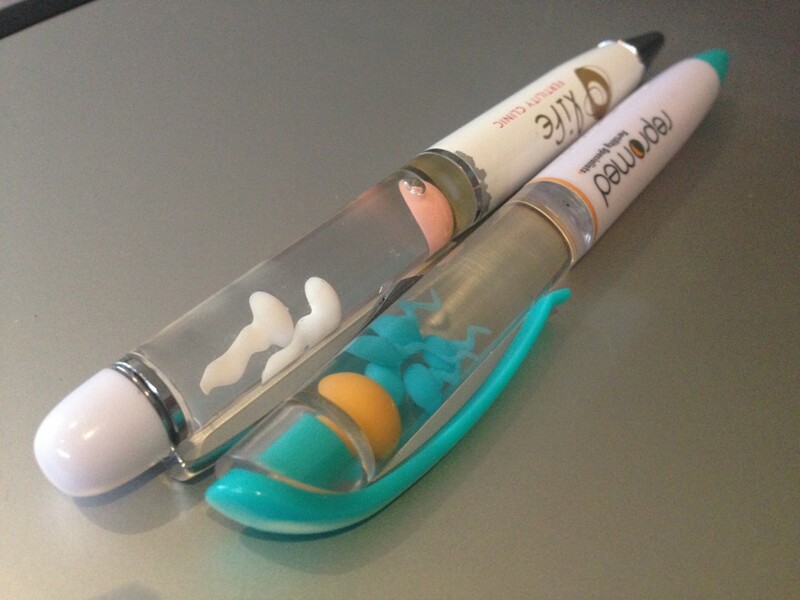 I was at a doctor’s appointment, and I was curious as to what the design on the pen was as I just couldn’t make it out; probably because I had no idea that it was a sperm and egg pen, LOL! Yesterday, I went to my doctor’s new address, so that I’m aware of exactly where to go before making my next appointment. I am so glad that I went out yesterday because, while I was there, a lady walked in towards the front counter with some items in her arms. I did not know what she was carrying until she accidentally dropped the items that she was carrying.